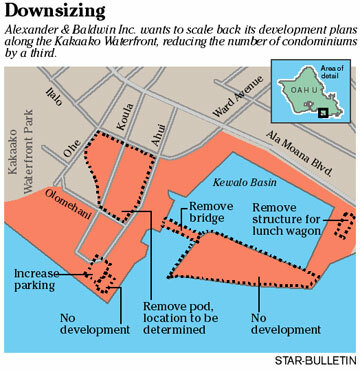 RESPONDING to criticism from surfers, sailors and community activists, Alexander & Baldwin Inc. has proposed to significantly scale back its Kakaako Waterfront mixed-use development by building one-third fewer residential units and leaving more park space along the shoreline. The company's new plan also would eliminate a proposed pedestrian bridge over Kewalo Basin, which executives said proved unfeasible given the need to let sailboats pass under the bridge to access Kewalo Basin harbor. Alexander & Baldwin's plan revisions, which executives presented to state officials yesterday, follow a 10-week public comment period during which the company entertained criticisms from an array of citizens. The new plan drew accolades from residents who attended the monthly meeting of the state's Hawaii Community Development Authority, where A&B unveiled the revisions. The authority manages the state-owned land where the proposed project would be built and is responsible for negotiating a development agreement with A&B Properties Inc., Alexander & Baldwin's real estate unit. "It's definitely a positive," said David Kelly, a member of Friends of Kewalo Basin Park Association, an activist group that had voiced concerns about the development's impact on oceanfront parks and the Point Panic surf spot. "It's a good, workable situation for everyone," said Gary Akiona, also of the Kewalo Basin Park group. "I guess some little people do make a difference." Anne Stevens, a citizen who criticized the development authority for not allowing enough public input into development plans, lauded A&B. "They're a great company; this is amazing," Stevens said after hearing A&B's proposal. "They listened where HCDA never would have." Long used as a light-industrial area where rusting sheds and car lots seem to belie its prime oceanfront location, Kakaako is undergoing a renaissance with the development of the University of Hawaii's John A. Burns School of Medicine, a proposed cancer research center and a new biotechnology facility being developed by Kamehameha Schools. According to its proposed deal with the state, A&B would be responsible for redeveloping a 65-acre, partially blighted area of Kakaako into a mixed-use "urban village," which would include a retail mall, farmers' market, hula amphitheater and park space. Although most of the development land would be owned by the state and leased to A&B, the company would acquire land on which to build its residential condominiums. The proceeds of the condo sales would help A&B pay for the public improvements that would not generate revenue. 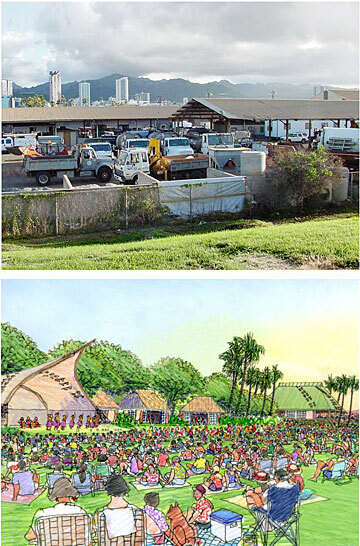 An artist's rendering of one portion of the proposed Kakaako redevelopment, as compared with a current photo, top. Stan Kuriyama, chief executive of A&B Properties, emphasized that the revision stops short of addressing the concerns of the project's most adamant critics, who oppose residential development on the ocean side of Ala Moana and the sale of any state-owned land to a private developer. » Reduce the number of residential towers from three to two and reduce the number of condominium units from about 950 to about 635. » Eliminate plans for new restaurants at Point Panic and Kewalo Basin, which would be left as undeveloped parks. » Create about 230 new parking spaces for surfers and other recreational users of Point Panic. » Eliminate plans for a pedestrian bridge linking Kewalo Basin Park and Point Panic. The revised plan still must be approved by the Hawaii Community Development Authority, but the agency's initial reaction was positive. The authority's chairman, James Kometani, said the revised plan included "many benefits for the public, including expanded park area." A&B is still assessing the financial aspects of the revised project, Kuriyama said. A&B will face lower development costs because of the removal of the bridge and restaurant buildings. One less condo tower also will mean A&B will have to buy less land from the state and spend less for it than the $50 million initially proposed. But A&B also will have about 315 fewer condos to sell. Whether the savings will be enough to offset lower revenue was not clear, Kuriyama said. "The financial aspects are still being evaluated," he said.